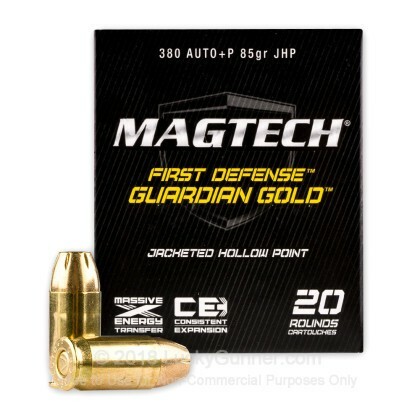 Magtech's Guardian Gold 380 ammunition is a great choice for premium self-defense ammo! It offers affordable personal protection that packs a powerful punch! 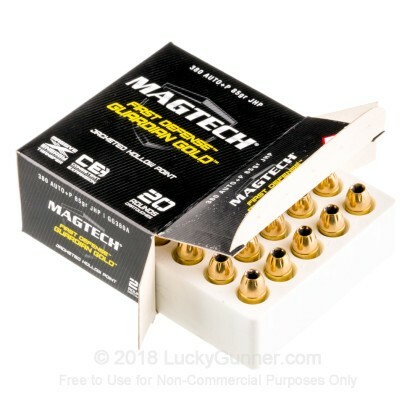 Thanks to its tremendous stopping power, deep penetration, awesome mushrooming and dead-on accuracy, Guardian Gold is fast-becoming a favorite among those seeking reliable, affordable personal protection. Every round of Guardian Gold undergoes an extensive quality control process before it ever leaves the factory. After passing initial inspection, each case is primed with reliable ignition primers, loaded with the finest clean burning propellants, and assembled with the specified bullet. Only after passing each and every stage is the loaded round approved for final packaging. After firing five rounds of Magtech 85 gr Guardian Gold from a Glock 42 into synthetic ballistic gelatin from 10 feet away through four layers of fabric to simulate clothing, we then measured the expansion and penetration of the bullets for this .380 Auto (ACP) load, which you can see in the chart below. 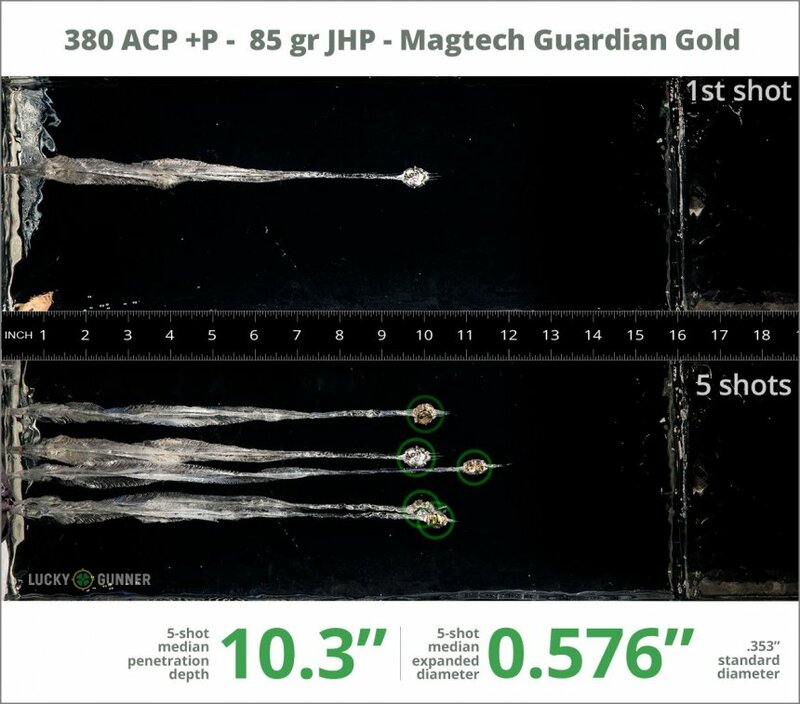 Finally, if you'd like to see how this Magtech load compares to other .380 Auto (ACP) loads, check out the diagrams at the bottom of the page. Want to know more about our ballistic gelatin testing and self-defense ammo? Check out Lucky Gunner Labs for more information. 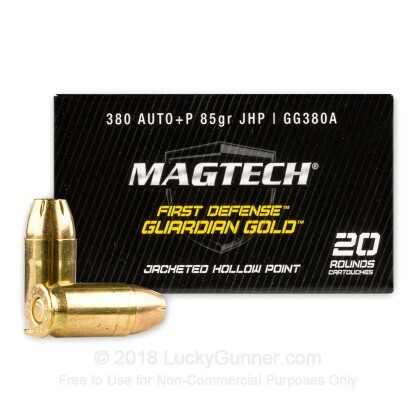 How do the results for this Magtech .380 Auto (ACP) compare to other 380 Ammo? 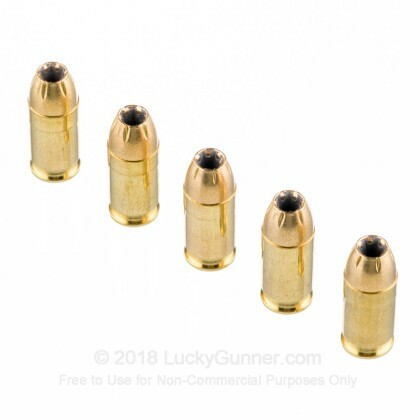 0.78" This ammo: 0.58" Min: 0.35" Median: 0.355" Max: 0.78"
10.3" 0" 6.5" 13.3" 28.7" This ammo: 10.3" Min: 6.5" Median: 13.3" Max: 28.7"
This ammunition ran through my PPK/S flawlessly and delivered the advertised velocity. 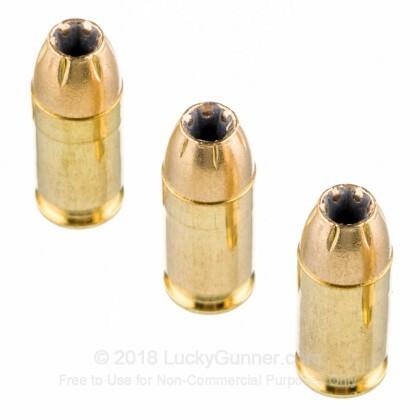 The load is hot, with a stiff recoil, and best used for self defense or occasional testing. 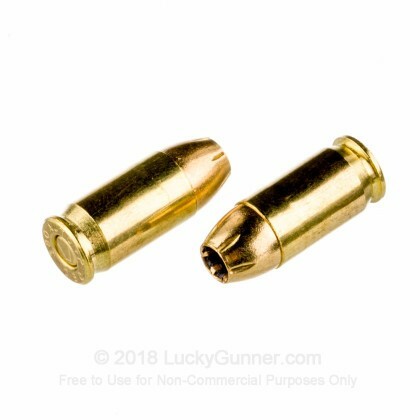 While the ammo has comparitively great value for defensive rounds and performed 100% for me, the bullets themselves are obviously not among the highest quality. Small deformities can be seen between each round. However, the ammo fired flawlessly in my bersa thunder 380. Ammo is excellent. No problems. As always, Lucky Gunner is superb with price and really fast shipping. A: Hello Tony, Yes, you can fire these 85gr. JHP rounds by Magtech in .380 Auto in your Walther PPK/S. These make excellent self defense rounds in .380 Auto. Q: I just purchased a s&w bodyguard .380. Can I shoot +p or +p+ ammo in this firearm? A: Hello Rebecca, Congratulations on the new firearm! I would check the owner's manual for the gun or contact the manufacturer to verify if it can shoot +P and +P+ ammo. The S&W Bodyguard is an excellent firearm.